Indications: (Rapid) Wind, pain, emotional shock: pathogenic factors cause qi stagnation leading to intermittent pauses in the pulse. (Forceless) Qi and/or blood deficiency, or Zang Fu qi deficiency: qi and blood deficient to the point of being unable to maintain consistent pulse. 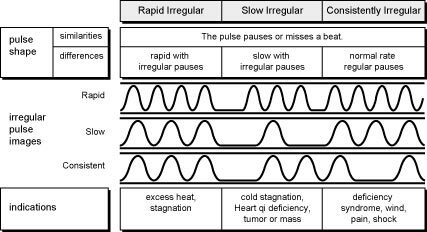 Explanation: the consistently irregular pulse is different from the fast and slow irregular pulses not because of the rate, but because of the consistently missed beat. Stagnation of pathogenic factors that prevent the regular pulse from taking place have not yet turned into heat which would lead to the rapid irregular pulse. Should this consistently irregular pulse be due to deficient causes (yin, yang, qi, blood), it will naturally be forceless. Whether it is a lack of Heart qi, Heart blood, or any other source of deficiency that can ultimately effect the Heart, we can find the consistently irregular pulse. Next: hurry up and wait, it’s the rapid irregular pulse.